Picster on Board is an extension of the bcanvas abstraction allowing people to draw directly to the canvas without having to resort to the external Picster patch. 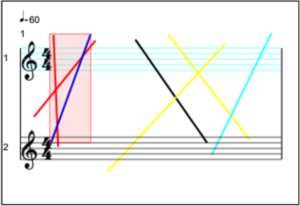 Picster on Board has nine drawing tools which will also be displayed in small red letters in the upper left-hand corner of the canvas after pressing the corresponding number keys. The name of a Picster tool appears in the upper left-hand corner after pressing caps lock. Drawn shapes will be attached to the top staff in this particular case. 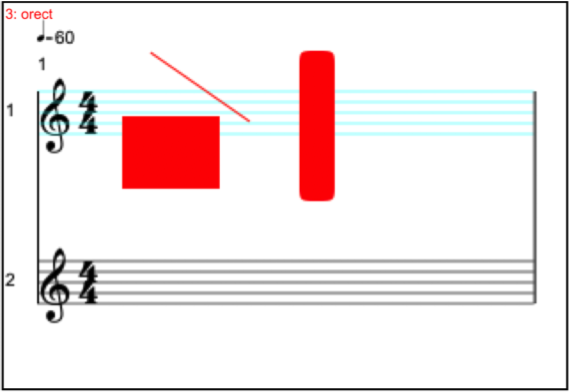 Picster can be activated by pressing the caps lock key after which the drawn shapes will be either attached to selected notes or to a selected staff. If a note is selected it will take priority over its staff. Note that notes(s) or staves need to be selected before the Picster mode is activated. 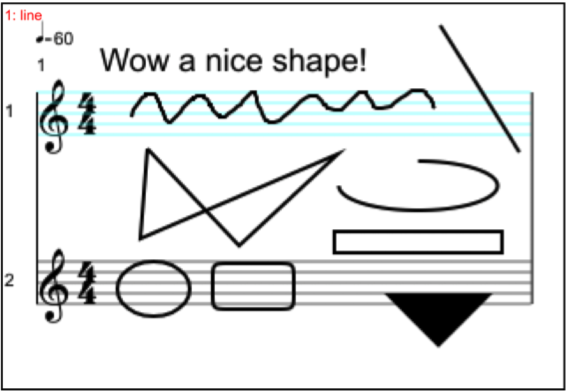 Once Picster mode is active, shapes can be drawn with the mouse. While drawing line segments, rectangles, rounded rectangles, ovals and arcs as well as free- hand drawing is straightforward (a shape can be created simply by clicking and dragging), it is important to note that a polygon requires a number of clicks. It will only complete after ctrl-clicking the canvas which closes its path. When the text tool is selected, a text box will pop up which can be written to. 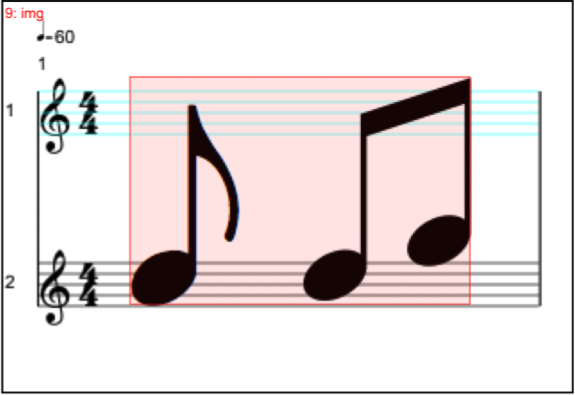 The text will appear in the score after clicking at the desired location. Bitmap and vector images can be placed with the image tool. Clicking on the canvas will open a file dialog and the image will be placed at the clicked location. The nine shapes drawn with their default properties. Note that the triangle on the bottom is actually a svg file. A text box opens when the text tool is selected. Properties can be set by sending message to the canvas or bcanvas abstractions. Color: send picster color and four numbers between 0 and 1 to set rgba values. Arc: send picster arc and two values to set start and end of the arc. Values are givenin radians. Property: sending picster property will determine whether a shape will be filled or not. Possible values are stroke or fill. 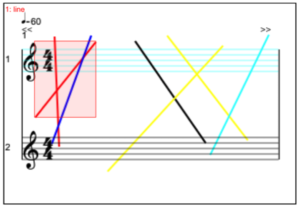 Picster on Board also receives messages for the creation of shapes via the second inlet of the mascore.bcanvas abstraction. These messages have the same result as drawing the shapes by hand, i.e. select the elements the shapes are supposed to be attached to first and set properties before the shapes are created. The offset are applied in terms of absolute coordinates i.e. relative to the canvas’s origin. When a shaped is clicked on, a red bounding rectangle will appear and the shape can be moved by dragging the rectangle to another location. Should shapes overlap, the “covered” shapes can be selected by repeatedly ctrl-clicking on them. The bounding rectangle will change its shape accordingly. Selected shapes can be deleted with the delete key. Clicking on an object will selected it. It can now be moved, deleted or edited. 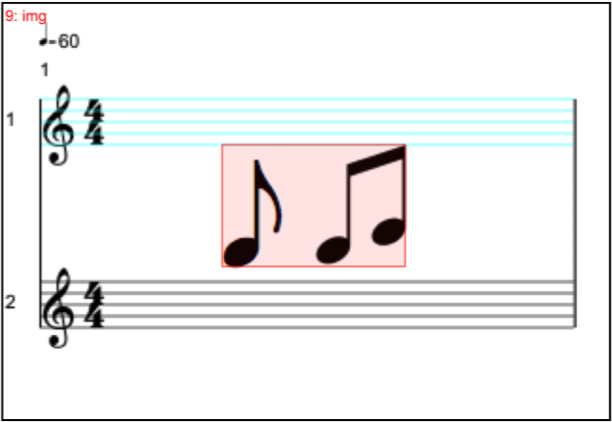 A shape can be copied, cut and pasted and thus attached to a different score element. 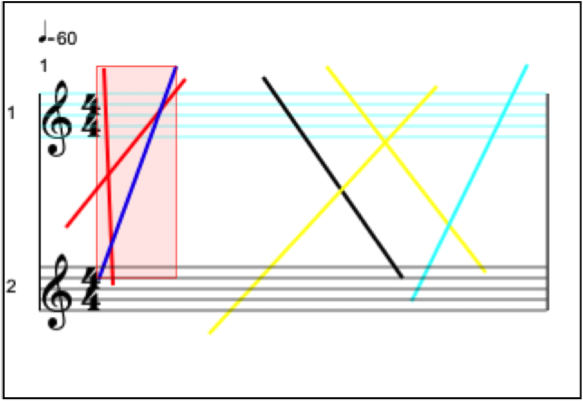 Use the c, x and v keys in Picster mode, but be aware of the fact that in order to select another score element, Picster mode needs to be first toggled off. Once the element is selected, Picster mode should to be activated again. 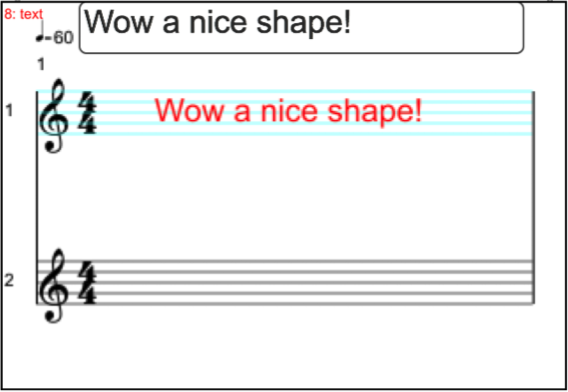 MaxScore allows you to also attach shapes to measures in addition to staves. This means that a shape will be shown automatically on everypart should the score be split or rendered to multiple clients. 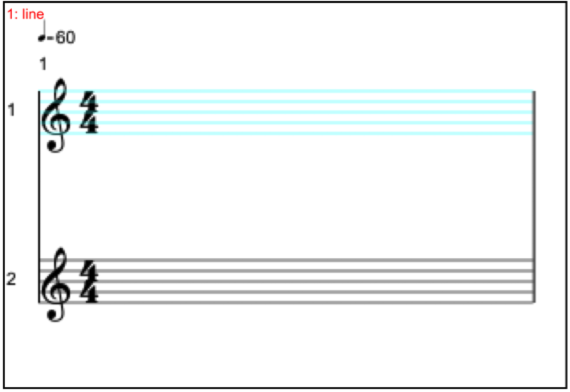 It’s best used for global instructions that affect every members of an ensemble at once, such as tempo or overall dynamics. Once a shape is selected it can also be edited after pressing the e (“edit”) key. This will open a text editor showing the properties of the shape in JSON format. The changes can be finalized by pressing the u (“update”) key. Note that if the fill property is supposed to be changed from fill to stroke or vice versa, the id (2nd line) of the shape will also need to be changed in order to take effect, i.e. a paintrect will have to be renamed to framerect, a paintoval to frameoval and so on. Changing the “transform” property for example to [ 0.5, 0, 0, 0.5, 0, 0 ] will shrink the image to half its size. Changes in the editor will take effect after closing the window and pressing the u key.